Welcome to the MAGIC BULLET Blog, where you'll always find interesting info on up-and-coming (and already-there) cartoonists! Our first MB8 Artist Interview is CAROLYN BELEFSKI. If you've been to any of the East Coast Comic-Cons, you know Carolyn Belefski as the cartoonist behind CURLS STUDIO. If you don't know much about Carolyn, read further AND also check out her site, where you'll find all sorts of goodies, including her store, all her links, and of course, her wonderful web comic, CURLS. by Washington City Paper, and is the writer and artist of the comic strip Curls at www.curls-studio.com/curls. Among her recurring characters and serial comic books are Kid Roxy, The Legettes, and Black Magic Tales. Her illustrations have appeared in USA WEEKEND Magazine, Virginia Living Magazine, The Commonwealth Times, The Connection, CROQ Zine, Baltimore Connect from AIGA Baltimore, Magic Bullet, The Pulse on COMICON.com, AOL ComicsAlliance, and more. She is constantly improving her skills and touring the east coast appearing at comic conventions and art shows. Carolyn is the Editorial Director of the excellent comics anthology Magic Bullet. How did you become a cartoonist? I have always been an artist and my parents encouraged it by taking me to art classes and Girl Scout summer camps. In high school, I was active with the Art Club and took many art-related classes. I earned a degree in Communication Arts and Design from Virginia Commonwealth University. I have formal design training, but have only taken one class in sequential art. What are your favorite things to draw/write about? Animals and strange creatures are a main source of inspiration for me. I also draw from observational humor and have a design and animation influence. Turtles, penguins, birds, and fish are all motifs of my work. What media do you use/tools do you find indispensible? I like to use brush pens and haven't figured out a specific one I like, so I mix it up a bit. I draw digitally for my Sketch Before Sleep series using a tablet. I should take an effort to experiment with other media like how I used to in college! I still have a ton of art supplies from that time period that want to be dived into. Do you consider yourself to be more draftsman or storyteller? Both, but ultimately storytelling is at the heart of all my art because content is king. Do you write your scripts? When you write, do you type out script pages, or do you handwrite with/in your sketchbook? When I write for my comic strip, Curls, I usually draw a thumbnail illustration with the dialogue in a sketchbook or on a scrap of paper which I re-write later my sketchbook. I work with writer Joe Carabeo on the comic books Kid Roxy, Black Magic Tales, and The Legettes. He types up his final script pages. My influences include my parents, Chuck Jones, Mel Blanc, Jeff Smith, Lauren Faust, Walt Disney, Elizabeth Watasin, Matt Groening, Vince Gill, Marty Stuart, Jean Shepherd, Vincent van Gogh, Marc Chagall, David Evelyn, and people who tell great stories or who are amazing visual directors. Animation, nature, Americana, well-done graphic design, humor, genuine people, and anything else that makes an impact on me. What music or movies, if any, do you play while you work? I cannot concentrate on my work while TV or movies are on. For me it's all about listening to podcasts or talk radio. Theater of the mind! Some of my favorites are Coast to Coast AM, Marc Maron, Art of Wrestling, American Routes, and Snap Judgment. What are you favorite films, and who are your favorite filmmakers/screenwriters? My all-time favorite film is The Wizard of Oz. I also enjoy films by Disney, Pixar, Judd Apatow, Paul Feig, and Tim Burton. Do you have animated versions of your work? Is that something which interests you? I did some simple animations in college. It is something that interests me, as many of my influences have a connection to animation. I just completed a freelance project that not only involved a print and social media campaign using my illustrations, but also featured my illustrations in an animation. Another freelancer animated the characters I created and I provided several expressions and body turns for him to animate. I'd love to see more of my work in an animated form in the future. Are comics art, craft, showbiz, or whut?? All of the above. Comics are entertainment, art, story, and putting on a show! The only way you can get things done is to do them yourself, but I'd say it depends on the circumstance. For my own projects, I will control it. If I'm working on a project for someone else there can reach a point where others are providing creative direction and I can learn to let go while also voicing my professional opinion if needed. For group projects, I've been delegating more and trusting that people will do their part of the gig. I have an Etsy store online but make most traction by attending several comic conventions of the east coast. Teresa Roberts Logan has put on a couple cARToons exhibits in the DC area that I've taken part in. It's great to catch comics up on the wall at coffee shop or other galleries because we are reaching out to surprise people who aren't expecting to run into our work while going about their everyday routine. There's so many to choose from and I like them all from different reasons! Attending Small Press Expo drew me into creating my own comics and wanting to exhibit. Baltimore Comic-Con is always a good time and has a great Artist Alley. Awesome Con was very exciting last year and has amazing possibilities. New York Comic Con is a grand spectacle and it is fun to be a part of that energy. There are also a few smaller shows in the east coast that have charm, but above all the main focus I enjoy at all the conventions is meeting people. What professional/cartoonists groups or organizations do you belong to, if any? I am co-chair of the Washington, DC chapter of National Cartoonists Society. 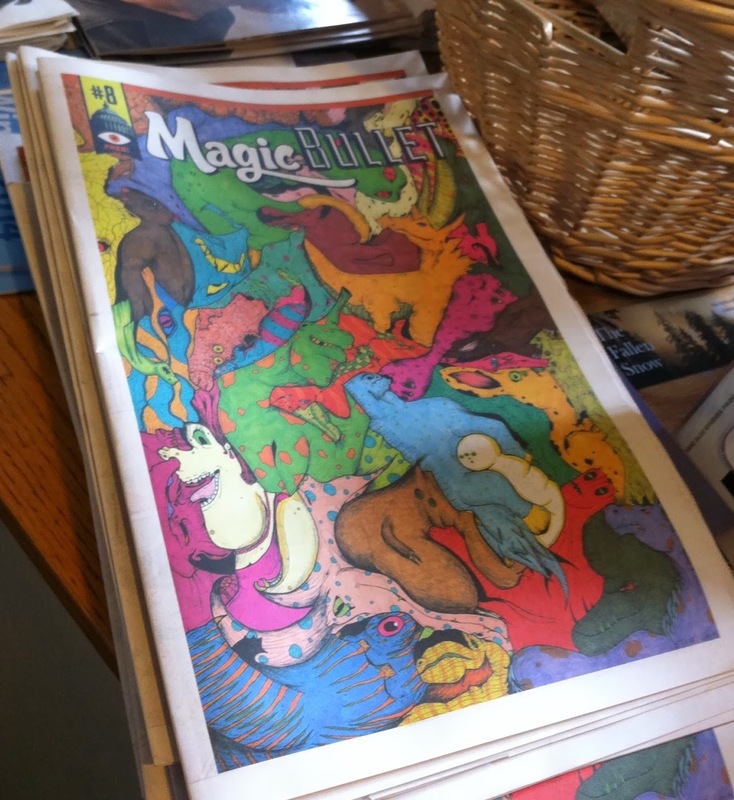 I also edit Magic Bullet, Washington, DC's comics newspaper anthology, which is published twice a year. I also helped to organize the Cartoonists Draw Blood American Red Cross blood drive, which is happening again on May 31. What tips/advice would you give aspiring comics-makers? Never give up. Keep working and year after year you will see your talent emerge. That and get out of the basement and meet people! ALSO, on Carolyn's blog you will see a list of all the drop-stops where cartoonists have taken stacks of MAGIC BULLET #8! THEY GO FAST, so check it out as soon as you can! We look forward to your comic submission! The next Meet-Up is Sunday, February 9, 2014 at Buffalo Billiards (1330 19th Street, NW, Washington, DC) starting at 5:30 PM. We will also be distributing Magic Bullet #8 bundles to everyone helping with distribution.